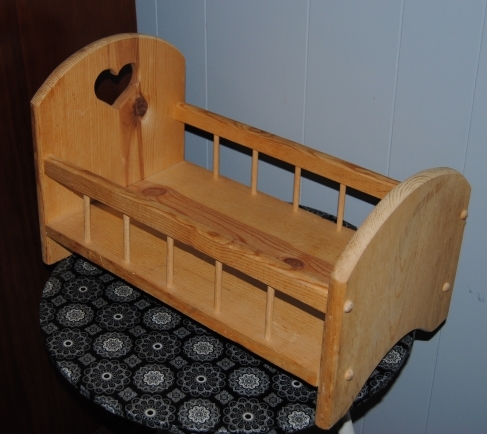 I saw this nice little wooden doll bed propped up against a thrift store wall, and found myself compulsively reaching out, and placing it in my cart. 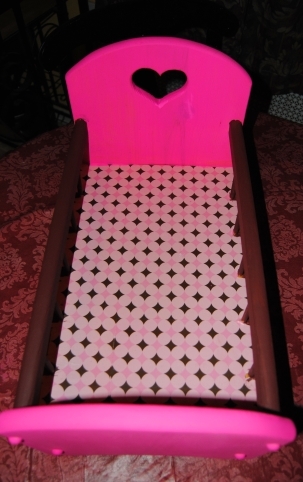 It was priced at only $2.99, and I am a total sucker when it comes to children and doll furniture. It looked like it was lovingly hand crafted and bore the battle scars of previous use. It had charm, and for these reasons I couldn’t resist it. 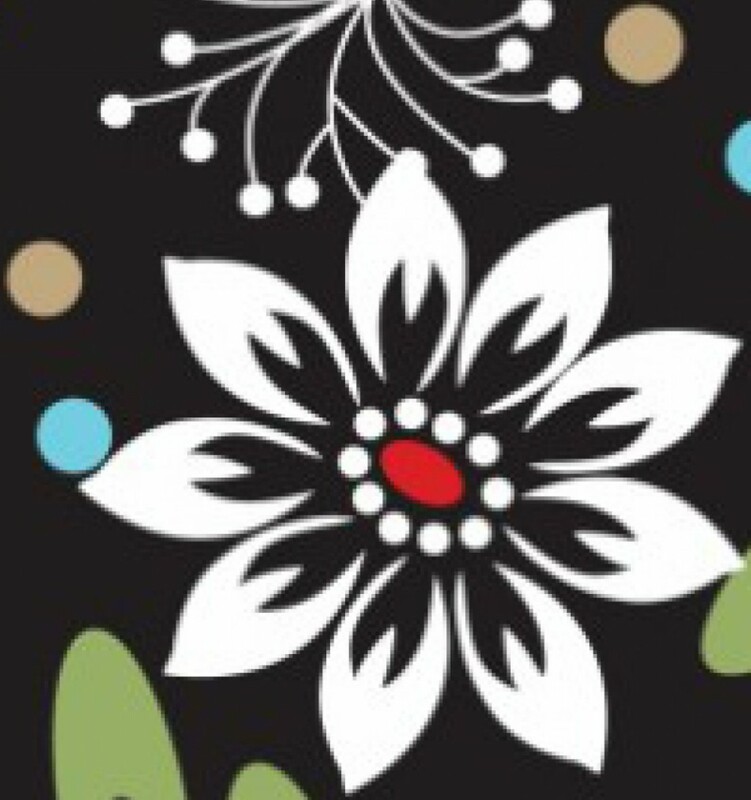 I decided to go with scrapbook paper for the decoupage. I picked these sheets up at Joann Fabric for a mere $.59 cents each. The biggest challenge was cutting out the paper to fit around the tiny spindles. I probably could have done this more cleanly in retrospect. I decided to square them off and I filled in any bare spots with brown paint. Once the paper was trimmed to fit, I used Mod Podge to slowly glue the paper to the wood smoothing out any air bubbles in the process. I allowed to dry and then applied another coat of Mod Podge over top of the paper and waited until the area was dry to begin painting. I decided to go with the bright pink and brown color scheme. I used two coats of pink and brown acrylic paint to paint the entire piece. Once the paint was completely dry, I applied another coat of Mod Podge over the entire piece to seal it. My plan is to add a doll pillow and an old receiving blanket for doll bedding. I would like to make one myself, but sewing is not one of my crafting strong points. 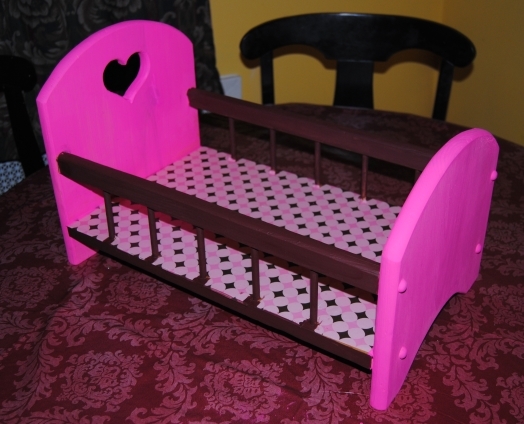 Now, my a little girl’s dolls have a stylish place to rest when in the world of my daughter’s imagination.